Home > Departments > Faculty > Luis Smith Ph.D.
Our research examines the structures and dynamics of materials in which organization of complex compositions over small length scales occurs: high surface area layered, exfoliated, or mesoporous metal oxides and inorganic/organic nanocomposites. Elucidation of these complex structures and motions is possible with the use of advanced scattering, both neutron and x-ray, and solid state NMR techniques. The combination of scattering and NMR allows for the study of dynamics over a large timescale (picoseconds to seconds) and of structures looking at the local environment through to long range order. The local coordination and symmetry of a surface species affects the properties of that site. An understanding of what factors control the distortions necessary to alter the surface properties is needed to intelligently tailor the reactivity of mesoporous or nanoscopic oxides and exfoliated nanosheets. These materials are of interest due to their potential to serve as catalysts, proton conductors, and building blocks for novel nanostructured materials. In the case of materials that are not amenable to traditional characterization via diffraction, these surface sites are difficult to characterize. However, spectroscopic methods that are not dependent on long-range order and are element selective have the potential to illuminate the nature of these species. To develop this correlation, we employ solid-state NMR methodologies such as multiple quantum magic angle spinning (MQMAS) and quadrupolar phase adjusted sideband suppression (QPASS), to examine the NMR active isotopes of early transition metals in these oxides. Information based on the electric field gradient sensed by a quadrupolar nucleus and the chemical shift anisotropy, both created by the arrangement and bonding of oxygen atoms surrounding the metal atom, are used to determine the local structure. Use of mesoporous oxides as confinement hosts is desirable due to their ordered nature, high surface area, and tunable well-defined pore sizes. These factors make mesoporous oxides useful hosts to study the effects of encapsulation of organic or inorganic species using NMR and quasielastic neutron scattering (QENS). The oxide host can affect the motion of the polymer through the interaction between the walls and polymer units. Confinement can also alter the phase that is produced from the synthesis of inorganic oxides in the cavities. Our research will focus on the incorporation of polymer electrolyte materials and lithium conducting inorganic oxides. Solid polymer electrolytes have been pursued as a replacement for the liquid solvents used in current battery systems due to safety and performance issues. The polymer bland work centers on combining a high molecular weight PMMA lithium ionomer block co-polymer with a low molecular weight species to create a semi-rigid film that contains a mobile phase for lithium conduction. The goal is to introduce the dynamics of a liquid phase while retaining the mechanical strength of a heavier polymer. To determine the efficacy of these materials as a transport medium, the environment and mobility of the lithium cation in the channels are characterized through solid-state NMR methods. 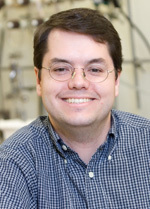 In particular, transport studies are conducted using the pulsed field gradient NMR facilities available at Clark University, which are well suited to measure the slow diffusion of the lithium atoms. "Triazole Functionalized Sol-Gel Membranes, Effect of Crosslink Density and Heterocycle Content on Water Free Proton Conduction and Membrane Mechanical Properties,” S. Granados-Focil, J. R. Conway, Y Meng, and L. J. Smith, J. Macromol. Sci., Pure Appl. Chem., 47, 1197-1202 (2010). "An Investigation of Distortions of the Dion-Jacobson Phase RbSr2Nb3O10 and its Acidexchanged Form Using 93Nb Solid State NMR and DFT Calculations,” X. Wang†, J. Adhikari†, L. J. Smith, J Phys. Chem. C, 113, 17548-17559 (2009). “Incomplete Double Frequency Sweeps to Select Small Quadrupolar Coupling Static Powder Patterns,” X. Wang†, L. J. Smith, Solid State Nucl. Magn. Reson., 36, 99-102 (2009). "Solid-state NMR strategies for characterizing high surface area niobates," X. Wang, L. J. Smith, J. Mol. Catal. A, 281, 214-218 (2008). "Site-selective QPASS for the isolation of large quadrupolar coupling environments," L. J. Smith and C. Seith, J. Magn. Reson. 179, 164-168 (2006). “Substrate and Field Dependence of the SPINOE Transfer to Surface 13C from Hyperpolarized 129Xe,” K. Knagge, L. J. Smith, D. Raftery, J. Phys. Chem. B 109, 4533-4538 (2005). "Dynamics of water molecules in glucose solutions," C. Talon, L. J. Smith, J. W. Brady, B. A. Lewis, J. R. D. Copley, D. L. Price, and M.-L. Saboungi, J. Phys. Chem. B. 108, 5120-5126 (2004). “Molecular Dynamics of Glucose in Solution: a Quasi-Elastic Neutron Scattering Study ,” L J. Smith, D. L. Price, Z. Chowdhuri, J.W. Brady, and M.-L. Saboungi , J. Chem. Phys. 120, 3527-3530 (2004). “Frozen-Solution Conformational Analysis by REDOR Spectroscopy,” L. J. Smith, F. P. Boulineau, D. Raftery, and A. Wei, J. Am. Chem. Soc. 125, 14958-14959 (2003). "Investigating CPMAS as a Spin Polarization Transfer Technique for Surface Studies Using Hyperpolarized 129Xe," J. Smith, K. Knagge, L. J. Smith, Ernesto MacNamara, and D. Raftery, J. Magn. Reson. 159,111-125 (2002). “Hyperpolarized Xenon Mediated Cross-Polarization to Material Surfaces Observed at Room Temperature and Above,” J. Smith, L. J. Smith, K. Knagge, E. MacNamara, and D. Raftery, J. Am. Chem. Soc. 123, 2927-2928 (2001). “Potassium Cation Effects on Site Preferences in the Mixed Cation Zeolite: Li, Na–Chabazite,” L. J. Smith, A. K. Cheetham, and Helmut Eckert, Chem. Mater. 13, 385-391 (2001). “A Variable Temperature Study of the Cross-Relaxation Dynamics of Hyperpolarized Xenon Induced Enhancement of Surface Nuclei,” L. J. Smith, J. Smith, K. Knagge, E. MacNamara, and D. Raftery, J Phys. Chem. B. 105, 1412-1421 (2001). “Site Preferences in the Mixed Cation Zeolite, Li, Na-Chabazite: A Combined Solid-State NMR and Neutron Diffraction Study,” L. J. Smith, H. Eckert, and A. K. Cheetham, J. Amer. Chem. Soc. 122, 1700-1708 (2000). “A Quantitative Description of the Active Sites in the Dehydrated Acid Catalyst HSAPO-34 for the Conversion of Methanol to Olefins,” L. Smith, A. K. Cheetham, L. Marchese, J. M. Thomas, P. A. Wright, and J. Chen, Catal. Lett. 41, 13-16 (1996). “On the Nature of Water Bound to a Solid Acid Catalyst,” L. Smith, A. K. Cheetham, R. E. Morris, L. Marchese, J. M. Thomas, P. A. Wright, and J. Chen, Science 271, 799-802 (1996).